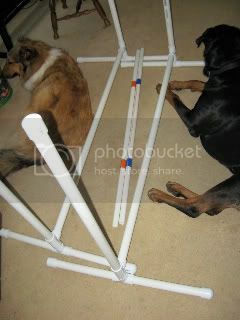 With two dogs in agility, I decided to try to try making some equipment myself and found plans for these online. Super easy to make and I have 4 now for the price of one. Awesome that your husband is able to make these things! Do you have a teeter? I've found just one problem with mine. Jump cup strips won't work because of the position of the stabilizing bar at the bottom. Will have to use clip-ons. What do you have for weave poles? I bought plastic fence posts last year for Baloo to use, but they're not working for Audrey. They have these curved plastic pieces to attach fencing to, and her longer hair gets caught in them. geez my dogs just are couch potaters! couch potato dogs are just as wonderful as any other dogs! yes I have a teeter, my husband made the base out of pvc pipes and a 2x12 board. My weave poles are made out of pvc also using lots of "T's" for the base. Right now I have a teeter, weave poles, 2 jumps, tire jump, and a chute. I'm envious! Would love to have a teeter and an A frame! Maybe I'll get brave and try to make them! Believe it or not, it's the hardware that intimidates me!! I want an A-frame too! My problem is I need a bigger yard I keep telling my hubby the kids need more room and we need a couple of acres out in the country.